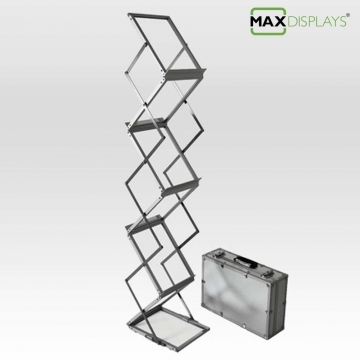 Our TopSeller collapsible Brochure / Literature stand. The Aluminium collapsible brochure holder is highly useful for trade shows, road shows, in store and retail displays. The sturdy construction of aluminium frames and the transparent Perspex makes is more appealing than the traditional Brochure/Literature stand. The clever Z-fold design makes it a breeze to assemble and pack-down.